Hello! My name is Jeremy. I’m 8 years old and I live in Cheltenham. 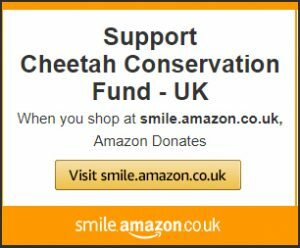 I’ve raised more than £2,000 for cheetahs. I make greeting cards that I sell any chance I get. My dad has brought them to his work, I sold them at a bazaar, on the pavement and door-to-door around my town. 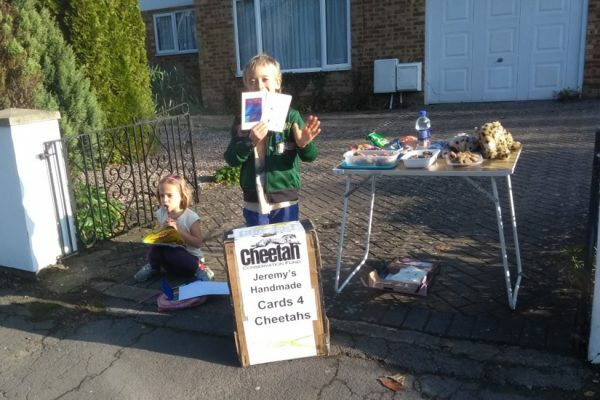 My mom has even created a Facebook page for my business called ‘Cards 4 Cheetahs’ and she posts photos of my card sales on there. Earlier this year, my mom emailed our local newspaper and a reporter did a story on my cheetah card business. Newspapers are always looking for good news stories! Then, my mom emailed BBC Gloucester and they interviewed me as well! You can see my interview here. For my birthday late last year my parents gave me the best surprise ever. They told me to get dressed for a day outdoors. It was cold and I thought we were going on a hike in the woods. After driving a bit, I could tell that where we had parked wasn’t a car park for the woods. 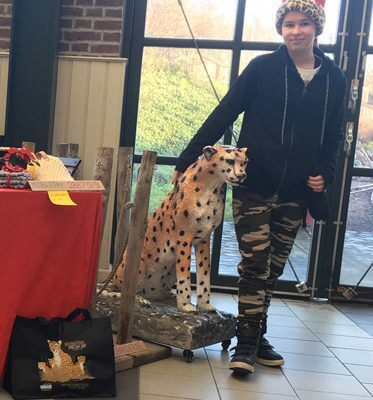 I saw signs for different animals so I knew it was a zoo of some sort but my parents stood in front of the cheetah picture on one of the signs. 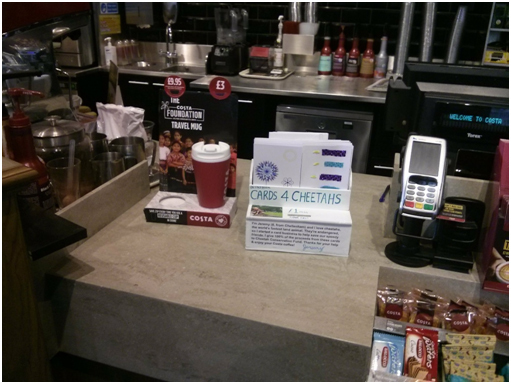 I was so surprised when I finally did see a sign with a cheetah on it – I was going to see real live cheetahs!! We went to the Wild Place Project which is the sister site of Bristol Zoo. We went to the cheetah enclosure but couldn’t see any cheetahs. Next, we listened to a mini-beast talk near the cheetah area and I got to hold a hissing cockroach. Then, from the window, we saw the cheetahs trot by! I almost ran as fast as a cheetah to go see them. They were so beautiful, even prettier than I had thought. Wild Place Project has a coalition of three brothers. The brothers trotted back and forth, not paying much attention to the visitors. Then one of the cats looked at something in the distance and its full attention was focused. At first we couldn’t see what he was looking at through the trees behind us, but after about a minute a keeper came through and we realised what it was! Cheetahs have amazing eyesight. The keeper gave a talk and afterwards we told him it was my birthday and asked if I could please watch him feed the cheetahs. He rearranged their feeding time to make sure that I could see. We came back especially for feeding time and the keeper let me try to throw the cheetah it’s dead bird lunch. I couldn’t quite throw high enough but it was a very special memory. It was so cold there and we wondered about the sleek African cheetahs. The keeper explained that African nights get to freezing temperatures, so cheetahs are actually fine in the cold weather. We heard the cheetahs make so many different interesting noises. I learned a lot about cheetahs in the wild that day and it was such a special birthday. I hope you get to see cheetahs one day, too! If you want to get involved in card making, you can buy good quality blank cards, practice your art, then put them together. I had to practice a lot before my mom let me sell the cards. Some people don’t even want a card, they just want to give to cheetahs and in fact most of the money that I raised is donations. 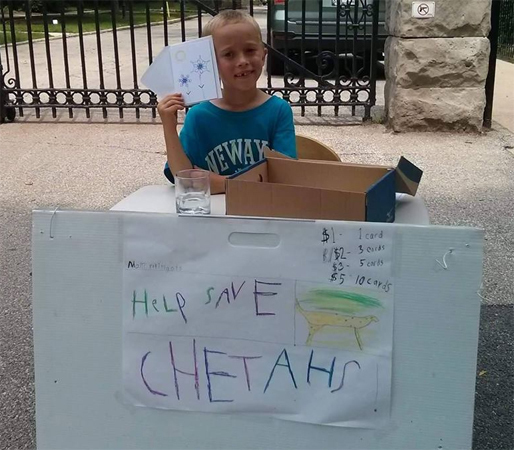 It’s not fun when people say that they don’t want a card or to donate, but I just think about the cheetahs and knock on the next door.